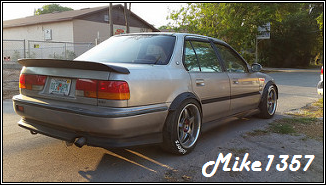 Rilas, you\'re right, I haven\'t been working on it much but I am still driving it every day. 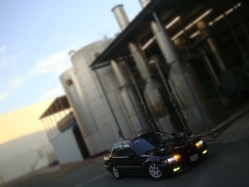 I feel incomplete when I haven\'t driven it. I\'ve been dragging my feet with the ITB\'s. What I need to do with those right now is send out the injectors to get cleaned and flow tested. Once I know what size they are I\'ll be able to get the car tuned. I\'ve been driving on my stock P13 for a while now as my tuned ECU will go full rich for apparently no reason on my drive to work. The Bille bumper was something I picked up for the time in between lips. My last bumper was damaged by a tire in the road a long time ago and I had no luck finding one in the junkyard in the same color. I never really liked it, but it was kind of fun to do something different for a while. \r\ngloryaccordy, I was really surprised how well the spoiler fit considering it wasn\'t made for the chassis. I really want to get it painted one color soon, but I want to have the look completed before I go to paint. Thank you for the support. \r\nGTRON, I saw the look RonaldTypeR had and I had to put my own spin on it. I actually need to order another set to replace my rubbed through ones. Thanks for the props. \r\nbseballkid1990, thank you. it\'s been a favorite of mine ever since the first time I saw one. \r\nNew this week, I had to pressure wash the lettering off the tires today. For some reason, the same paint I used on my last set of tires turned brown very fast with this set of tires. I think I\'m going to just take some paint pens and color in the factory lettering on the tires. Much easier to touch up and clean that way. 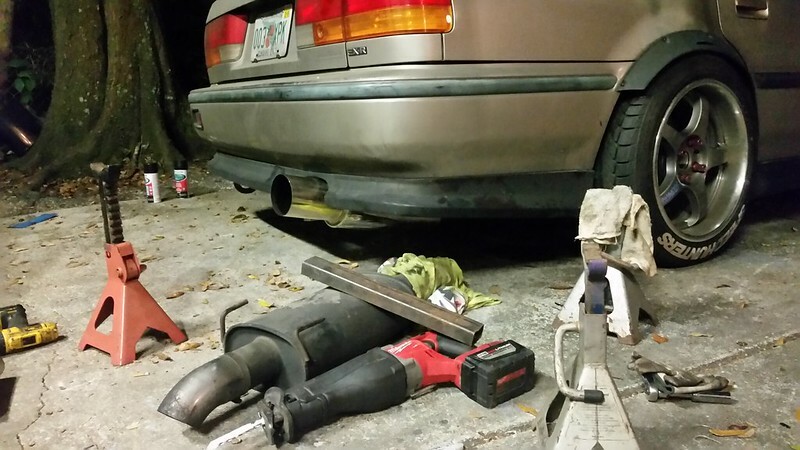 I also had the chance to have the 350Z ISR muffler welded on this week by a new friend. He got the angle of the dangle just right and it look and sounds far better than I was expecting. 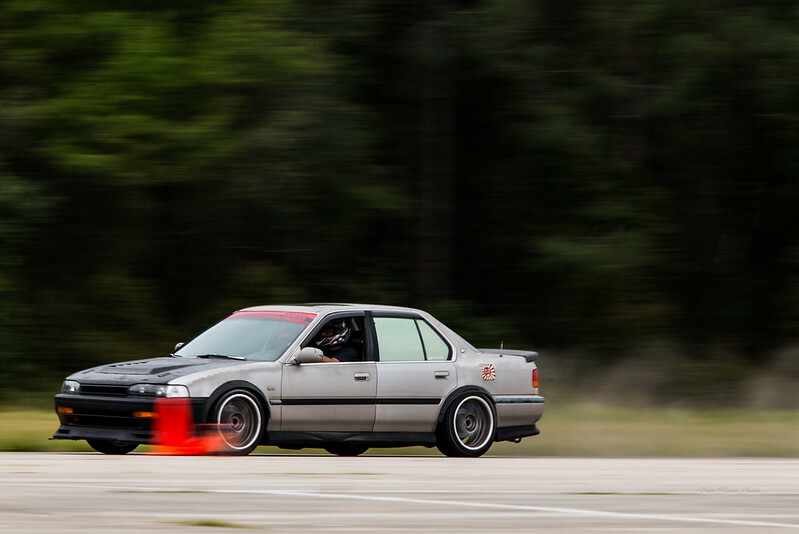 \r\nThis coming weekend I am going to another autocross event so I\'m looking forward to feeling the differences with the LSD trans and lighter wheels with better tires. It\'s been almost a year since the last one I went to. Hopefully I\'ll be able to borrow a GoPro again. 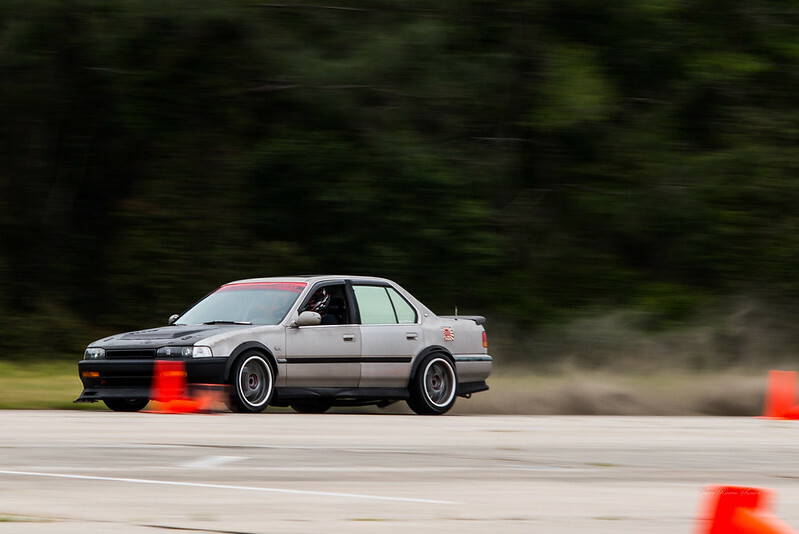 Had an absolute blast at Autocross this past weekend. Finished in the top 10 winding up 9th out of about 30 cars. its gotta feel good beating out vettes and other sports cars. Bathe in those salty tears! I\'m surprised I do as well as I do to be honest. Especially since I\'m not in any particular class, just grouped in with everyone in an open class. I was talking with a few people there and they were saying it looked like I was moving. 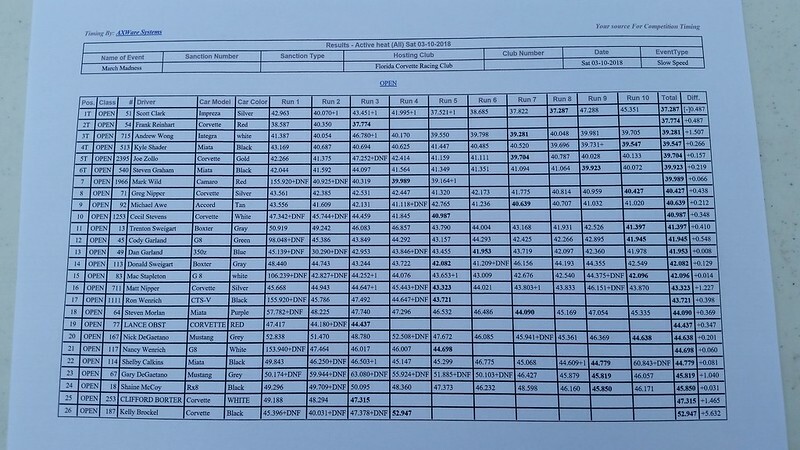 I want to get my times up there with that Integra but that would mean I would need slicks at a bare minimum. I want to get a few chassis braces and then go out there again so I can feel the differences. Great car. Looks 10X better with the new bumper and lip! I\'m very jealous of that lip! Say, ever think of losing the splitters? 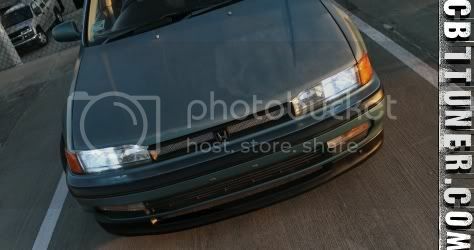 (under the lip) and changing the hood? \nThat 4th last picture where the front is in focus and the rear is a blurrrrr... nice pic. 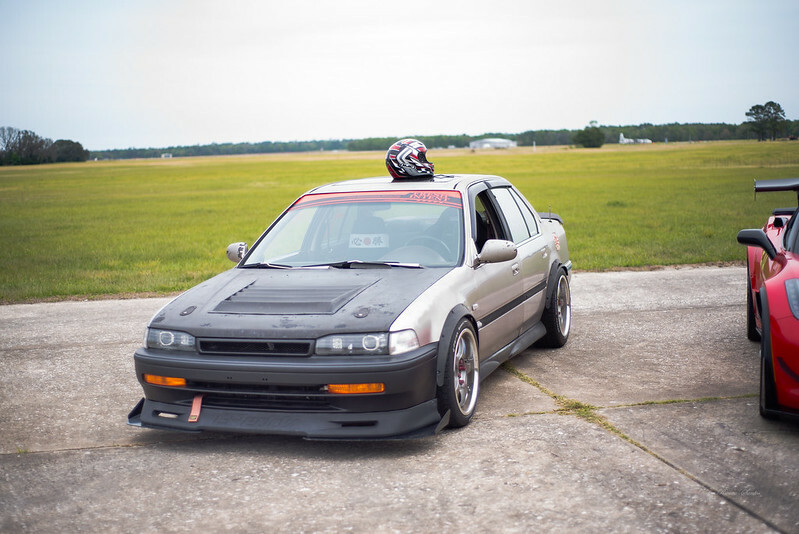 \nedit: it\'s a CF hood with functional vents is it? The trick is figuring out which brand braces to get. I won\'t knock ESP for rigidity, but it looks like tow hitch stock material. I\'ve been trying to find a Cusco front strut bar for ages and I don\'t think a Neuspeed will fit over the H.
\r\nI\'ve thought about changing the hood, but the one design that I like, I\'d have to ship from Malaysia. My current hood is a stock steel hood with a hole cut for the vent and yeah, it\'s functional. 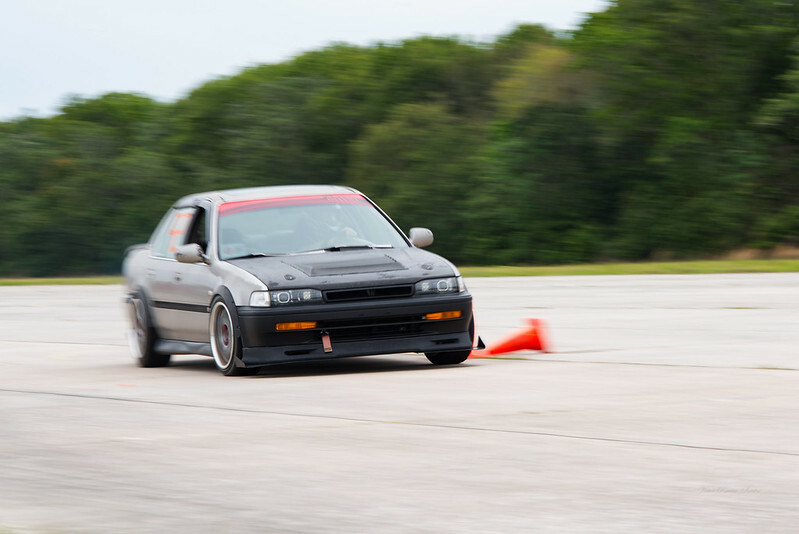 The splitters are really just there to add rigidity to the lip and protect it a bit. This is my third one. I still need to put my canards back on the car. \nlol 3rd one. Meanwhile in Canada I\'ve been looking for 5+ years. 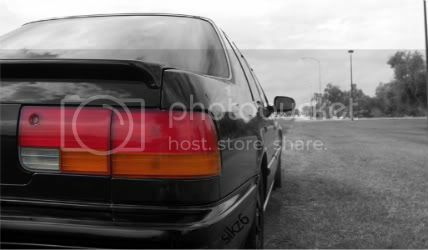 Oh, I did photoshop your car with no hood vent and lower splitters, may post it later in here if you don\'t mind. The secret is replica parts. I\'m not huge on knock offs but as much as the real ones cost and as many times as I\'ve cracked them, I\'m all for fiberglass. All of mine I actually bought from someone in Canada. \r\nFeel free to post the picture. I\'ve been thinking of trying to photoshop my car one color one of these days. \nYou\'re right...the Neuspeed won\'t fit with the H22. You could grind the VC on the H23 to make it work, but not the H22. \r\nIt\'s a shame, because the Neuspeed brace was fantastic. Welp, I decided to pick up an Ultra Racing front strut bar this weekend and I\'m somewhat eager to see how I like it. I\'ve only ever seen pictures of them so I might even do a product review thread on it to give others insight on it. \r\nI\'m torn between making my car a clean car with a stock hood and no flares, and making it a zany track style car. I certainly need to get on making a set of diy SI-T lights because I feel it will really tie in the rest of the front end together. 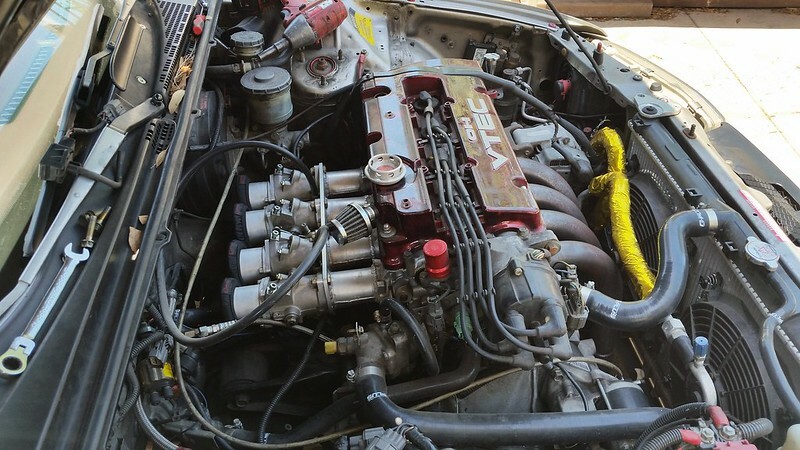 I may unbolt the canards for a few days and see how I like it because that picture does look pretty slick. \nThe Ultra Racing front bar is decent, but the ESP.net bar is, a massive improvement on the Ultra Racing bar, I\'ve had both on Lola. Still though you made a good purchase Mike, you will notice the front stiffen up a bit. The Ultra Racing front bar is decent, but the ESP.net bar is, a massive improvement on the Ultra Racing bar, I\'ve had both on Lola. Still though you made a good purchase Mike, you will notice the front stiffen up a bit. \nMine is sitting in my living room waiting for me to install it. I cant wait. Well well, where to start. I recently moved about ten minutes from where I used to live so that put things on hold for a little while. I did end up installing the ultra racing bar and I was definitely happy with the improvements it made to the steering. After that everything kinda went downhill. \nMy car began to start overheating during stop and go traffic with my one radiator fan barely being able to keep up. I ended up scrounging up some universal electric fans from around the shop and soldered on some stock connectors. Somewhere in the process of doing that I damaged the wires going to my high pressure switch so I grabbed a pigtail from the junkyard to fix that. After fixing that I found out the system was severely undercharged. After leak testing the system, and passing (which means I have a super slow leak), I popped some more refrigerant into the system and it\'s blowing nice and cold once again. \nThe car was beginning to look really dingy at this point. Not having the time to wash it myself, I just decided to have it washed at work. That\'s where I screwed up. The detailer decided it would be a good idea to spray wheel acid on the barrels of my wheels to "shine them up". The clear started peeling off of all 4 wheels and, being that these are the nicest set of wheels I\'ve ever had and they were in near mint condition, I was upset to say the least. 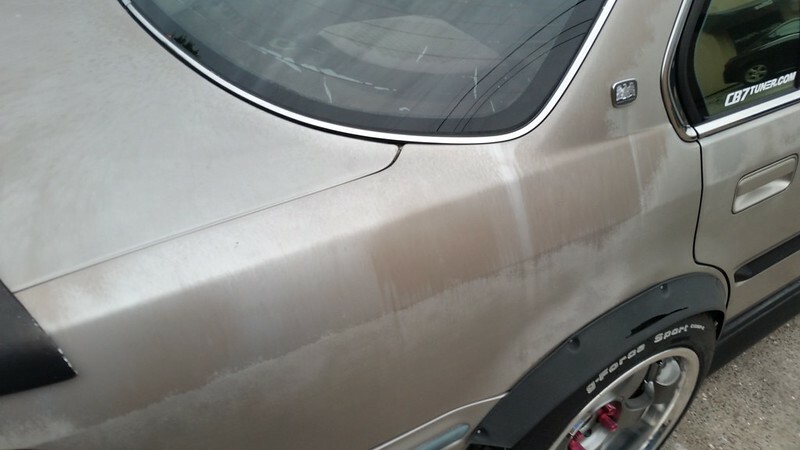 Either there was acid residue in the soap bucket or he let the soap dry on the car, but now the paint is severely stained as well and the car just looks awful now. Not that it was particularly a great looking car before, but now it looks so much worse. 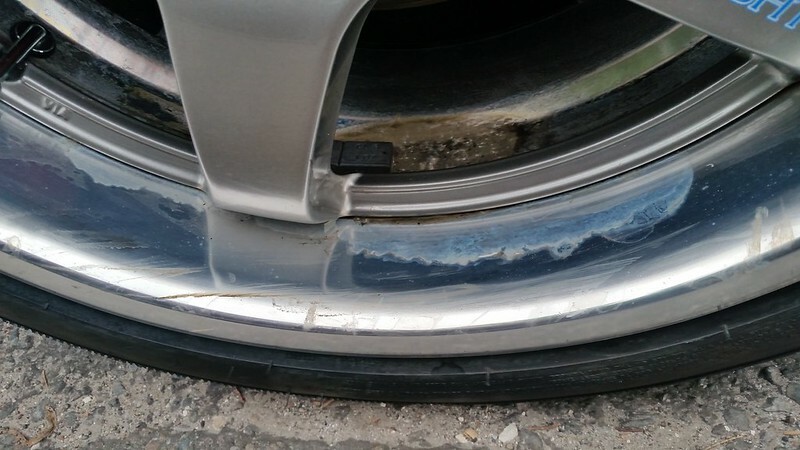 I talked with my favorite local wheel repair shop and they say that they can\'t restore the wheels to the clear over polished lip finish so it looks like I\'m stuck trying to figure out how to get the rest of the clear off and then polishing them from now on. All I\'ve gotten is grief from the boss and a sorry from the detailer. \nThinking I was out of the woods after all that, I started smelling gas when I had the fresh air vent on. Turns out all the studs for the fuel rail had either snapped flush or came loose so my fuel rail was just kind of bobbling around in vaguely the right spot in the engine bay. I had heard mention from another member here that they had a similar thing happen to them. I\'m not sure if the studs were over tightened long ago, if the vibrations from the solid mounts caused premature failure, or if the IACV bouncing around may have put stress on them. Regardless I had to panic and remove the intake manifold to get what was left of the studs out on a Friday. I still had my stock intake manifold so luckily I was able to steal the studs from that to gently reinstall in the skunk2 with some lock tight. I was able to find some silicone vacuum tubing so I moved the IACV down by the steering rack to get it out of the way. If there was a silver lining to this, it was that I did get the chance to see if my ITB setup would clear the brake booster (it does). Got that all back together and my throttle jammed open on the test drive which scared the ever living hell out of me. Turns out a small piece of plastic had broken off the inside of the throttle position sensor and me uninstalling the throttle body allowed it to move around into the danger zone (heh). Had a spare TPS on my old skunk2 throttle body but, being that my current throttle body is what I imagine to be a cheap knock off, the TPS wouldn\'t adjust out properly. She\'s still my daily driver so I just slapped it back together to get me home. \nToday was the day I damn near lost my mind with the surging idle so it was time to rig it up. I ended up cutting part of a vacuum T fitting to slide over the sensor stud to compensate for the sensor not adjusting properly and now it reads almost perfectly within specs. While I was doing all this, I decided to fix the deformed butterfly plate the throttle body had (I picked it up used from a friend when I was in a pinch). I had noticed that a VQ35 throttle body had almost the same size butterfly plate as a generic 70mm honda throttle body. No time to measure, only time for action. VQ throttle bodies are notorious for going bad so we had a bunch sitting in a core pile at work. I drilled out the screws that held the plate in, drilled new holes to match my plates mount points, and bolted it in place. It\'s all back together and running and idling better than it has in the past 4 years. \nDid I mention my inner taillight decided to desintegrate and my drivers window regulator is throwing a fit? Somewhere in there I managed to pick up the wagon trunk floor bits from the junkyard and install them, which I must say was a pretty decent mod. \nSo now you are all caught up. Thanks. I ended up going to the Tampa auto show instead. That\'s funny though because I still have that plate at my house. Must\'ve given the number to someone else. \r\nto get to see more of my cb click the link below. seats need a little tlc, but other than that, you got a nice ride. Thanks guys. The drop has been a long time coming and the CF hood was too good of a deal to pass up. Cleaned her up last night and I\'ll try and get some more pics today. Only one more for now. I\'m loving this stance! \nBig thanks to Mike and John for helping me out with the install. Looking good man. How does it ride? man, got some memories here. my old wheels and suspension. \nlooks good man. i know you\'ve been working at it for a while. \nRides good. A little bouncy, but that\'s to be expected with lowering. I\'m definitely considering rolling the rear fenders though, the tires rubbing all the time is getting a little annoying. \r\nlooks good man. i know you\'ve been working at it for a while. 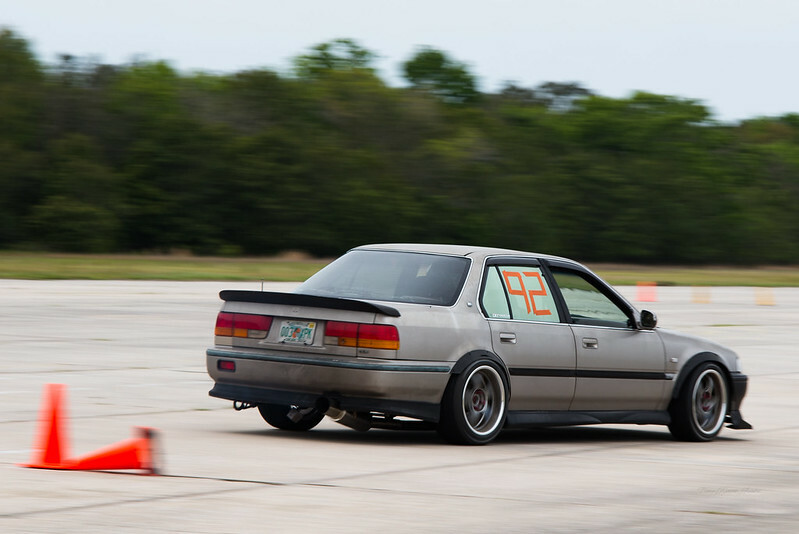 \nI remember this was the setup you were running at the first meet I ever went to. When I saw it I knew I had to have it. If it weren\'t for you hooking me up with those parts I wouldn\'t be lookin this good right now. Thanks again man. looking good son. treat that hood well. \r\nwhat makes a man a man? \nWill do man. Gonna wash and wax it again this weekend. Hopefully by the end of the week I\'ll have my drivers license back and I can hit up some meets again. \nIt was a really good deal. Got a red light ticket while turning right on a red light at 56th and Fowler quite a few months ago. I wasn\'t aware of this until I went to renew the registration for the car this month. \r\nI did a drivers license check as a step in renewing my registration and it said my drivers license was suspended due to "failing to pay a traffic fine". I found out today that the site updates the "suspended by" date to the day you log on so my license has probably been suspended for a while. \r\nGoing to the courthouse to pay the ticket tomorrow and, according to what they said, once the ticket is payed my license will be reinstated. I hope that\'s the case. All I know is that I hate being driven around in my own car. 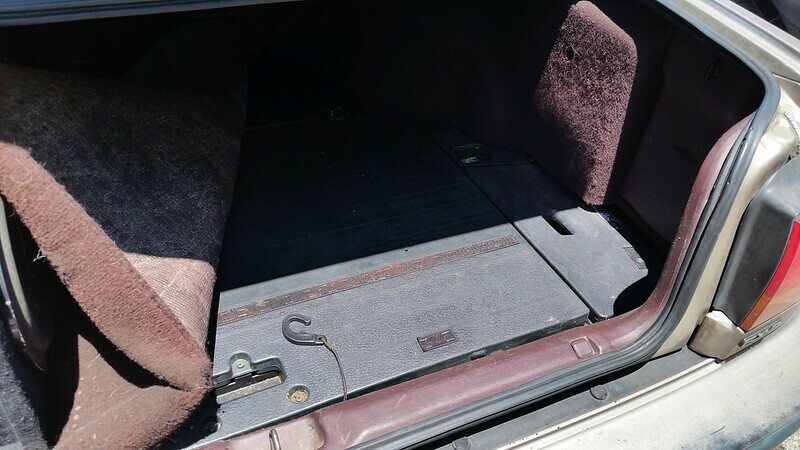 Probably going to shoot for some prelude seats before I get another trunk. I don\'t feel like swapping out the lock cylinders anytime soon. BB4 seats. They keep me planted really well for stock seats and they drop right in (from what I\'ve heard). The CB seats are absolutely horrible in terms of holding during a turn and I\'m sick of having to readjust myself after a corner. Picked up a few goodies from the yard today. I was surprised I got it all for only $12. Visors, cupholders, lower garnish, and...? Correctly sized speaker pods for the front doors so I can get rid of these crappy best buy rings and zip ties. Haven\'t taken pics in a while. Here\'s how she sits now. Took the lip off for the time being. The trick is figuring out which brand braces to get. I won't knock ESP for rigidity, but it looks like tow hitch stock material. I've been trying to find a Cusco front strut bar for ages and I don't think a Neuspeed will fit over the H.
You're right...the Neuspeed won't fit with the H22. You could grind the VC on the H23 to make it work, but not the H22. It's a shame, because the Neuspeed brace was fantastic.